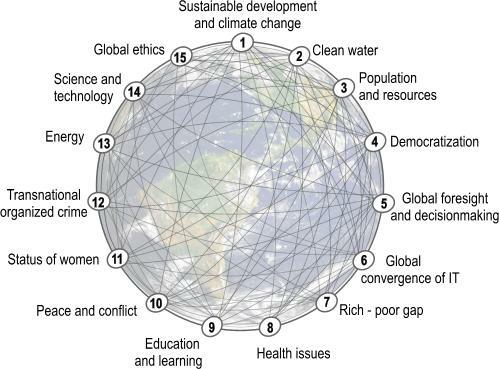 The 15 Global Challenges provide a framework to assess the global and local prospects for humanity. Their description, with a range of views and actions to addressed each, enriched with regional views and progress assessments are updated each year, since 1996. A short overview is published in the annual State of the Future,while continuous updates and details are available on the Global Futures Intelligence System website: https://themp.org. The 15 Global Challenges are a result of continuous research, Delphi studies, interviews, and participantion of over 4,000 experts from around the world, since 1996 — see a short history. The Global Challenges are transnational in nature and transinstitutional in solution. They cannot be addressed by any government or institution acting alone. They require collaborative action among governments, international organizations, corporations, universities, NGOs, and creative individuals. Although listed in sequence, Challenge 1 on sustainable development and climate change is no more or less important than Challenge 15 on global ethics. There is greater consensus about the global situation as expressed in these Challenges and the actions to address them than is evident in the news media. Subscribers have access to the entire menu listed above, to discussions, as well as the entire research of The Millennium Project since 1996. Readers are invited to contribute their insights to improve the overview of these 15 global challenges for future editions.